One of the main strategies I identify as a key to living well on less is eliminating eating out for convenience and limiting our food spending to groceries and restaurant spending for dates and group social events (and the occasional reward). Kyle and I both used to occasionally buy fast food at work, while driving from work to an evening activity, or when we were too hungry to take the time to cook. We also would end up letting some groceries go bad because we weren’t on top of the stock we had in our fridge. I consider this money to be a waste because we were spending a comparative lot of money on food for those meals but didn’t even want or really enjoy them because they were bought and consumed on the go. We still eat a lot of meals at work for lunches, when we stay at work through the evening, and when we go straight from work to a church activity, but now they are always home-cooked. In fact, I haven’t bought a lunch at work because I failed to brown-bag my lunch since before we got married! The food we are eating is much healthier for having eliminated these meals and we’ve reduced our eating out/grocery budgets, enabling us to devote that money to savings. The quick answer is that I seldom cook after work and Kyle only does a couple times per week. As I stated earlier, several days out of the week I pack both my lunch and dinner to bring with me to work, and on most of the remaining days we get home late enough that I don’t have the patience to cook before eating dinner. What I do is batch cook virtually all of my lunch and dinner food on the weekends and after dinner in our free evenings. That way all we have to do is reheat when we are ready to eat! I find I’m much more likely to cook in the evenings when I’m not rushing due to hunger (Kyle doesn’t get so hungry, so he can cook before eating). In the last few weeks I’ve even started batch cooking my breakfasts to save time in the mornings. I’m also really into easily assembled meals (can’t really be considered cooking) and very quick recipes when I am cooking freshly. The real advantage of batch cooking from a monetary perspective is just that it will make eating homemade food so much more likely, thus eliminating the premium we pay for food prepared by others. Of course, normal single-serve cooking does the same thing, but it is time intensive. Batch cooking is an amazing time saver because it really doesn’t take much longer to prepare and cook than a single serving would, plus you don’t have to spend time deciding what to eat for every meal (you just grab whatever’s in the fridge). Some people pair batch cooking with meal planning and grocery lists to take advantage of the grocery sales cycles to buy their groceries at discounts. My experiment with meal planning last winter met with failure (increased grocery spending) so now I just prefer to let my batch-cooking dictate what I eat. Oh, that is one downside to batch cooking if it’s just you eating it – you will eat the same things over and over so if you crave variety it probably won’t work out without freezing the food. Another commenter on my GRS post stated “I want an example of some of the recipes you are batch cooking for breakfast,” so I’m going to share here links to my most frequently used recipes. split pea and ham soup (~10 servings) – I love this dish because it is so high in fiber. I aim to eat at least 25 grams of fiber per day. sausage chili (~10 servings) – This tastes amazing, especially since we use hot ground pork sausage from our CSA as the meat. yellow curry (~5 servings) – I’ve gone through several yellow curry recipes and this is the first one that gets close to the taste of restaurant Thai yellow curry, though it still needs more tweaking. hamburgers (8 servings) – Every time I cook burgers now I use 2 lbs of meat and make 8 4 oz patties. When I reheat one I add a slice of cheddar cheese and eat it with half an avocado. salmon burgers (4 servings) – We buy frozen wild caught salmon patties from Costco and I just grill or bake four at a time. paprika chicken (4 servings) – I am not a big fan of chicken but this recipe adds a lot of flavor. Brussels sprouts and bacon (3 servings): This is my current favorite recipe. I make it about once per week. I can’t even tell you how delicious this is. 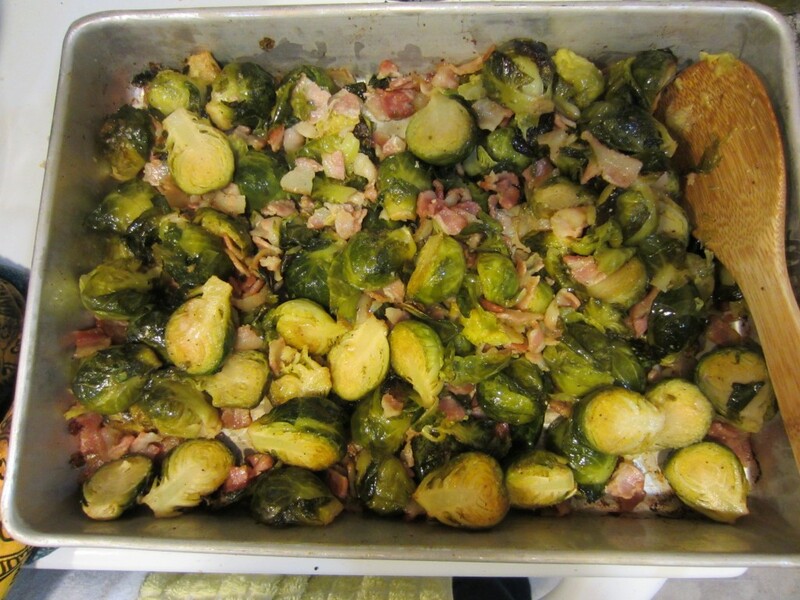 It’s not just me, either – it’s a big hit at potlucks (probably because of the bacon). broccoli (2 servings) – Kind of a no-brainer – just steam a large pot of broccoli and divvy it up. Sometimes I melt cheddar cheese on top. For us this makes 2-3 servings. garlic mashed cauliflower (2 servings): It doesn’t have the same consistency as mashed potatoes, but it’s still extremely delicious. Egg and vegetable casserole (4 servings): This is what I’ve been eating for breakfast lately, though I’ve heavily modified it so that each serving contains 3 eggs, 3 oz of mushrooms, and 1.25 cups of spinach. I also substitute feta cheese for the salsa sometimes. flaxseed meal pizza (4-8 servings) – Another high-fiber dish with the added benefit of being high in omega-3 fats. I like this low-carb/gluten-free version of pizza more than the cauliflower version – it holds together better. 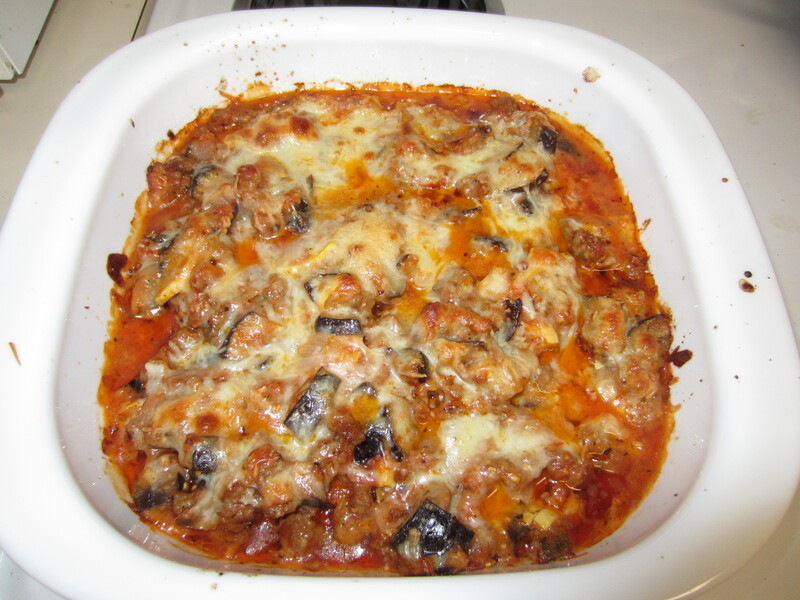 eggplant, zucchini, and sausage – A nice mix of meat and vegetables (and of course) cheese in a casserole – again we use the delicious hot ground pork sausage from our CSA. sauteed vegetables: I’m currently making this dish with spinach but over the summer I do with squash. Just sautee the vegetables in olive oil (add garlic for the spinach) and add Parmesan cheese right at the end. breakfast quesadilla: This is my own invention. I cook 4 strips of bacon and add them inside a low-carb tortilla folded in half with ¼ cup of shredded cheddar cheese. Microwave for 1 minute to melt the cheese. Just so you don’t get the wrong idea, I do cook freshly during the week as I have time and also eat some raw foods, so this isn’t the only food I eat. We also incorporate the seasonal produce we get from our CSA into our eating during the spring and summer, so our diet looks a little different at those times than the fall/winter recipes above. Do you batch cook often and if so what are you favorite recipes? What are the barriers preventing you from batch cooking? How would your budget be impacted if you stopped eating out for convenience? 46 Responses to "Eliminate Eating Out for Convenience with Batch Cooking"
What works best for me is freezing individual servings of soup. To make the individual servings, fill a muffin pan with soup and stick it in the freezer. Once frozen, take it out, flip it over, and pop the frozen soup out. Then transfer the “pucks” of soup to a container and put them back in the freezer. I like this approach for several reasons, including that most soups are easy and inexpensive to make, there are tons of healthy options, and if you get enough variety in your freezer you can have a different kind of soup every day. That’s a really interesting method! I like the idea of being able to eat a modular amount of soup – I break it into 1 cup serving sizes at the moment. We cook ‘for the day’ and also do batch cooking. This saves you time/money when you just want to eat something and wouldn’t go to the trouble of cooking. Does cooking for the day mean you cook all your food for the day in the morning or the evening before? After reading all your menus I really got hungry. We usually lunch out once a week and that’s after attending a mass. We have a group of friends who eat together after church every week, which is wonderful, but we don’t often buy restaurant food to eat with them. I don’t eat or we bring our own. Batch cooking is something I’ve been meaning to get better at and I’ve been slacking in the cooking department. This post has motivated me to actually make it happen. That’s my goal tonight. Make a vetch of something and freeze the left overs! I am all for batch cooking, within reason. It HAS TO freeze well, because I cannot stand eating the same thing for a week straight. So soups, chili, sauces, are all on my list. It also has to retain as close to its original texture as possible because I really dislike veggies when they get mushy, for example. Alicia @ Financial Diffraction recently posted..October bonus money update. I’ll have to check out your yellow curry recipe. I just made a batch of that last night using TJ’s premade sauce. It’s tasty, but I’m trying to move us away from premade sauces over time so we have more “whole” ingredients. We batch cook in a similar way -it feels like the only way to go when you’ve only got 1-2 people otherwise there would be so much waste! But a lot of my meals are soup since I eat that for lunch almost every day at work. We tried one curry recipe using powdered curry spice and one using a premade grocery store sauce and didn’t find either to be satisfactory. This time we took our friends’ advice and bought yellow curry paste from the local Asian grocery store (way, WAY cheaper per ounce than at the American grocery store). It definitely has been the best so far, but as I increased the vegetable:sauce ratio it turned out rather watery and Kyle want it to be a bit sweeter (that’s how he usually reacts to Paleo recipes). We do a lot of batch cooking, especially soups, and store them in the freezer. We store them in wide-mouth mason jars (like these http://fave.co/17ILEWf) and then we can thaw them in perfect single-serving portions. I usually pull one out of the freezer and into the fridge the night before and then take the jar to work to heat up for my lunch. Easy to carry and leak-proof! That’s really clever! I didn’t realize soups were so popular for batch-cooking. What great looking recipies. I love the look of that casserole. I’m eating for one these days and work from home, so I generally have the time and patience to just cook single meals. I know it’s more time intensive but it helps me avoid eating the same thing over and over. Just yesterday I did a roast with sweet potatoes and carrots in the crockpot, and while it was delicious I’m sure I’ll be sick of it by Friday. The casserole is to die for. 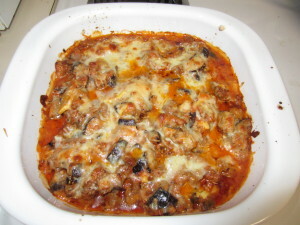 I made it every week when we were getting eggplant and sausage in our CSA. Very like lasagna but way better for you. If it’s worth the time to you and gives you greater satisfaction I’m all for it! I tried batch cooking once and it went well. I haven’t done it since but I would like to do it again. It saves a lot of time! Now that you are self-employed you can reorganize your time to spend more time cooking less frequently – I’m sure it will free up lots of your time, especially since you can fit in work or chores while things are cooking. We like the Best Recipe Make Ahead cookbook. Stews also tend to make a lot and freeze well. We do a lot of batch cooking on weekends and a lot of quick stove-top stuff during the week. It’s easy to freeze leftovers and defrost them later when we’re busy. nicoleandmaggie recently posted..What do you miss from high school? I haven’t heard of that book – thanks for the recommendation! I love crock pot dishes but it’s easier for my way of eating to just eat vegetables straight up so that’s why I tend to do more of those. We are pretty bad about remembering to take things out of the freezer well before we need them – or doing it and then not having time to cook after all. Ugh. I don’t do much batch cooking because, like Alicia eating the same meal multiple times per week doesn’t work well for us. It tends to make us order out instead. But we have a side by side with four separate households, so freezer space is at a premium. So I do cook after work, despite frequently not getting home until after 7. It’s when I don’t get home until 8 or 9 that I usually just don’t want to cook. Edward Antrobus recently posted..Do You Try to Save Money on Medical Expenses With Home Remedies? If I get home and have to eat but don’t have anything ready, I’ll just eat a serving of nuts. That keeps me satisfied long enough to cobble something together. I know it’s bad, but if I don’t get home until after 9, I just won’t have dinner that night. Just this past Saturday, I worked 14 hours and had only had breakfast by the time I got home, but I was so beat that I simply took a shower and went to bed. This isn’t for everyone either, but we needed a break from batch cooking and have gone to day-ahead cooking. On Sunday we make double portions of whatever we’re having, and then we’re always doing day-ahead prep throughout the week. Monday we’ll come home and reheat whatever we had the night before, and then later in the evening we’ll cook the next night’s meal. That sounds like a great plan, too – although like with batch cooking I guess you are limited to food that reheats well. THanks for this emily – I usually am one to fall victim to going out to eat when I just dont have time to cook. These will help me prep for that. I’m sure batch cooking will go along nicely with your hunted meat stores! I’m incredibly lucky to have my wife to handle almost all of the cooking for me, but when I’m on my own this is absolutely what I do. I really can’t stand cooking, so I’d much rather do a big batch once and eat the same thing a few days in a row than find something new to cook every single day. I really like cooking and I still prefer batch cooking. Even if I had more time I probably would still batch-cook. I mean, most recipes are for at least 4 servings! If it were up to me I would batch cook most of the time but my boyfriend complains we always eat the same thing, even if it is frozen and served the next week. I loved the slow cooker for puddings too, they turned out really great. 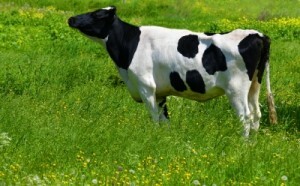 I guess it’s lucky for us that we don’t mind the monotony of eating the same thing over and over! What is your favorite pudding recipe? Batch cooking! It always saves so much time for me. I have a busy week between work and classes and want that homemade meal at the end of the day, but often am too tired to cook. Such a life saver. I love making huge portions and having easy, healthy leftovers for days. When I lived with my ex, he would eat EVERYTHING – no matter how much of it I made. It’s a nice change to have the extra effort of extra food prep finally pay off. Stefanie @ The Broke and Beautiful Life recently posted..Love and Money: When Should You Have “The Talk”?